Certificate as awarded to Tre Kronor following this nomination. I nominate Tre Kronor. Truly a neighborhood restaurant with many regular customers. Breakfast, lunch, and dinner. Uniformly good food at good prices. I am especially partial to the veal chop (a common special), the salmon, and the pork tenderloin. Dishes look good with many extra touches that show care. For example, the mashed potatoes have a dab of butter and a few chive bits in the center. Good bread and good deserts. Rates RRR among Reader raters. Friendly, friendly place with fresh flowers and white tablecloths. I can second this one. Very home-y comfort food, nice outdoor dining when weather permits, BYOB, and a great, safe place to take non-adventurous diners. Very pleasant. Hey Jack, or NR, could you please link to previous discussions on Tre Kronor? As noted, that is the primary qualification required for a place to be awarded as a GNR - a decnt track record of postings on a place by multiple LTH posters. 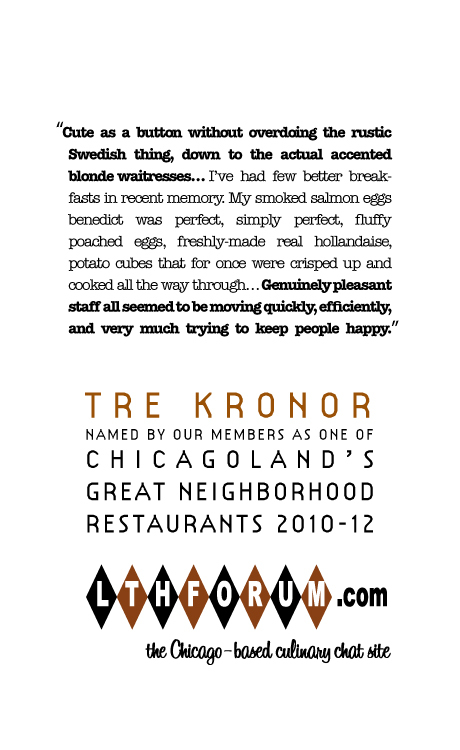 If Tre Kronor does not have such a track record, then the best place to start is by posting on it in the Chicagoland Board and get others to chime in and/or try the place. The Reader's ranking, while of interest, does not really count. We are not surveying other reviewers or information sources to compile a great list, as much as we love the Reader and its reviewers and despite the fact that some of them are us, or is it we are them??? I count eight threads with mentions of Tre Kronor, although a number of them are just superficial references (still suggesting it's on LTH'ers radar screens). The first of these is probably the most relevant. Well, I suppose I did not pay enough attention to: that greatness ought to be reflected on this board. In that respect, I suppose Tre Kronor does not qualify. So feel free to remove it. Probably just as well. If it made the list, I would probably end up waiting longer that I do now for a table. Well, as with the other nominations... let's see if anyone wants to add to the knowledge base on these places. I'm a fan of Tre Kroner, my usual being weekend breakfast, though I hope to experience the Julbord one of these years, which seems a holiday favorite among LTHers. Thumbs up for GNR renewal. I support renewal of Tre Kronor's GNR. We'd long been discouraged by the reports of long waits for weekend breakfasts but last August we stopped by for a Friday late breakfast on the way up to Kenosha. No wait at all, a lovely table by a window; Swedish pancakes for Lucantonio, a "Stockholm omelet" for me (with falukorv sausage and havarti), and one of the daily specials for Antonius (some kind of Norwegian sausage as I recall). It was great: food, setting, service, everything. I wish I had more free time on weekdays for leisurely breakfasts like that. Despite being more or less in my neighborhood, I don't get to Tre Kronor often enough. This is a true GNR no matter what definition of the term you care to use. I strongly support its renewal. I too support the renewal of Tre Kronor as a GNR. Even before I started lurking on this board—many, many months ago—I was a fan of TK, having first eaten lunch there when I was tutoring graduate students at North Park U. The food is consistently excellent. Most posters speak of breakfast, but we also like a quiet BYOB dinner there. The herring appetizer is very tasty, and my teenaged daughter loves their Ostsallad with sautéed goat cheese rounds over mixed greens and bacon. (I now make my own version at home for her, earning me over-the-top praise about being the best mom ever.) Entrees (I’m especially fond of their duck breast) and desserts are very good too. The place draws from the neighborhood and North Park U., and the service is usually quite pleasant. And how many restaurants, GNRs or otherwise, have troll murals? My visits to Tre Kronor have been confined to two Julebords. One feels transported to Sweden for an intimate meal with family and friends. For this experience alone, I am very much in favor they retain their GNR designation. If you don't get one of the danishes you're missing half the point of going there. Vanilla-Hazelnut and Maple Pecan Being my favorites. They have fruit ones as well apple, rasberry but the vanilla-hazelnut is the bomb. The danish dough is flaky and delicious! The LTH Small Household Food Exchange held its March meeting at Tre Kronor, and ordered almost everything on the menu - a fact that speaks to the compactness of the menu as well as our appetites. I believe that I speak for all of us in commenting on how enjoyable the meal was. The shrimp salad on brioche was delicious and the herring delightful as usual. The Swedish meatballs were excellent and was the pork roast with fruit. A very satisfying meal, served well, at a very pretty restaurant. Aside from breakfasts and the Julebord for which Tre Kronor is beloved, they do a very creditable job at dinner as well. Breakfast again last week. While their corned beef hash "style" may not be for all (chunky, not finely chopped), I love it. And the atmosphere. And...and...and.... Entirely too much to recommend in a single post; maybe it's best to just retype the menu. In any event, Tre Kronor typifies what a GNR is all about. I very highly endorse renewal. I must really like Tre Kronor, because I think the GNR should be renewed despite the fact that they don't know how to hard boil an egg. Just about everything else I tasted in my one visit last year was excellent, and the place gives me the same warm-fuzzy feeling as Sunshine Cafe. The menu has changed a bit since Tre Kronor was first awarded GNR status, but it's as good as ever. I completely support renewal. Kennyz wrote: I must really like Tre Kronor, because I think the GNR should be renewed despite the fact that they don't know how to hard boil an egg. Maybe not, but they sure can poach. Tre Kronor is actually in my neighborhood, and I'm glad it is. It's a real gem! Have long loved Tre Kronor for brunch, in particular smoked salmon eggs benedict, but in the last year or so have discovered the joys of TK's dinner. Lightly sweet aquavit-cured salmon with dill sauce or herring to start, well thought out salads, entrees ranging from cod to duck breast to rib eye steak and blueberry soup for dessert. Coupled with terrific service, no corkage fee BYOB and reasonable prices its a perfect date night for my bride and I.
Tre Kronor, count me a fan! I feel exactly the same way based on exactly the same experiences, limited to Julebords two years-in-a-row. There's really no other dining experience like it: small, apartment-like second floor dining space; one room devoted to groaning boards of somewhat familiar and somewhat exotic food; Swedish girls singing with candles on their heads, the holiday spirit made tangible and edible. Most of my Tre Kronor visits are for Yulebord at Christmas. It is one of the most European Christmas celebrations in the city. I am not in Chicago, I am in Sweden for those few hours. For this month long event every year, it belongs as a GNR must do.